VITEEE 2019: The Exam is a term in association with VIT admissions. The VIT, Vellore Institute of Technology offers programs structured around 13 different schools of study. Admissions here are available for UG, PG and Research level. VIT is among the prestigious technological institutes. Latest Update:VITEEE 2019 Slot Booking is started from today 28th March 2019. Scroll down to check. 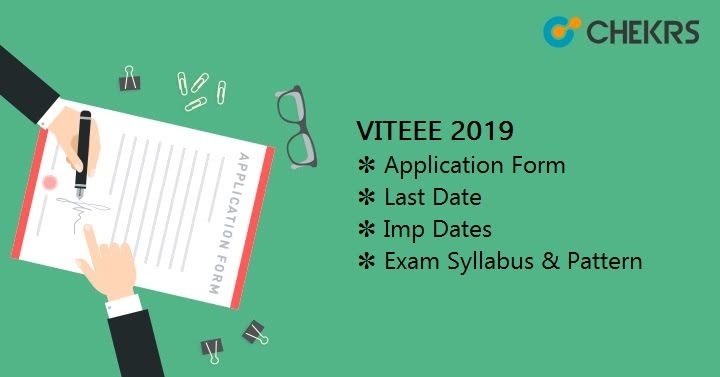 Latest Update: VITEEE 2019 Application Form Last Date has been extended till 21st March 2019. The freshmen who seek admission in B.Tech can get entry through VITEEE conducted by the institute. The VITEEE stands for VIT Engineering Entrance Exam. At UG level one can take admission in B.Sc programs as well other than engineering. By reading the complete article will help all students to learn information of the exam such as eligibility, VITEEE Application Form, exam dates, syllabus, the pattern of exam, its result and other post examination important details. It is not only the exam dates that are important for one to stay attentive, rather right from application filling to result and counselling for qualifiers, but a lot process are also involved that are equally important. Thus here catch out important dates given in the easy tabular form to have a glance. The institute has its certain benchmark termed as VIT B.Tech Eligibility Criteria for those who want admission in the engineering field. As the exam can also be given by those students who have recently appeared in class 12th exam, so the VITEEE Eligibility will help students a lot to pursue graduation from their dream college. Age limit: The candidate should have achieved minimum age of 17 years. Applicants should have achieved the aggregate of 60% in Physics, Chemistry and Mathematics/Biology in 10+2 examination. An aggregate of 50% marks in Physics, Chemistry and Mathematics/Biology is important for SC/ST and applicants belonging from J&K, Arunachal Pradesh, Assam, Manipur, Meghalaya, Mizoram, Nagaland, Sikkim, and Tripura. Admission to B.Arch: Based on the performance in NATA 2019. Filling up the application form is first and foremost step to be followed by all candidates possessing the interest in the exams. The process for it is online only. The VITEEE Online Application Form will begin quite early, thus here we are providing information through which catching all of them will be easy. Open the website using provided link. From the home page click on the link of Apply now available next to admissions. Choose your option from the pop-up menu and proceed. The registration page will open up; complete the process through required necessary steps. Once done, access the VIT Application Form and submit your required details in each field. Don’t forget to recheck all mentioned details. Once done, click on submit and proceed to payment. After payment of application fees, VITEEE Application Form Fee your submission is complete successfully. The fees can be paid online or in the form of Demand Draft drawn in favor of VIT University. What is the minimum required for VITEEE 2019? The candidates should have a minimum of 17 years of age at the year of admission. Is The The Exam Authority Provides any Mock test for the Exam? Yes, It can be found on the Official Website. Is there any facility available to Modifying chosen Exam date and Center? No, After booking the Slot, The Submitted data can’t be changed. Is there any need to enclose Documents along with Application Form? No, There are no Need. For Any new update and instruction, we have to wait for Notification. VIT is among the best institute for engineering studies; hence it is obvious to keep a standard in the selection of candidates. Here we have given the VITEEE 2019 Exam Pattern through which one can know on what priority s (he) has to perform in exam. Through the VITEEE Paper Pattern, it is also easy for all students to manage their practice sessions accordingly. Marking Scheme: One mark for each question and no negative marking if answered wrong. Taking into account the selection, every applicant wants to get selected in the institute. However, as it is a national exam admission of all is not possible. Thus, VIT Syllabus for B Tech helps all those who want to get selected. The syllabus will help all aspirants to understand what shall be studied and what not. Here we will be providing all candidates a detailed New VITEEE Syllabus Pdf so that preparation can be on track. The online examination across the country will be conducted on different dates in 3 slots each day. Thus to confirm the dates and time of availability by each candidate, VIT Slot Booking will be crucial. If any applicant is not able to attend the slot booking, as per information is given in application form any random test center will be allotted as it is ‘first come first serve’. Our detailed VITEEE Slot Booking Procedure will help all to complete the mandatory process. Applicants can stay alerted VITEEE Slot Booking 2019 Date through regular updates shared by us and direct link given for the same purpose. Post to slot booking, admit card is another important document necessarily to have the applicants. Those who have done slot booking later will be given VITEEE Hall Ticket for getting entrance in the exam hall. You will get VITEEE Admit Card Download option provided by us by the direct login page provided to you. The announcement of result is made in form of VITEEE Merit List. Those who have given the exam can expect to get their results announced by the month of May. Students can check their results online only once the results have been updated post to VITEEE Result Date. Here being your online information source you can check both result and VITEEE Result Date and Time through the updated provided by us regularly on time. The merit list will decide which candidates will get admission as per availability of seats. Counselling is the final leg after which students from different courses selected as per their performance has to confirm their admissions. The VITEEE Counselling will be done in order to confirm admission given in any of the campuses as per availability of seats.